We have had some good times with this game, and mostly when the fights start (we become some kind of Game Geek Hooligan) Being the mechanic for the fight quite fun, is also quite easy to fall down on an strategic matter where you can advance the final result 90% of the times based on the stats and equipment of players. 1.- IT IS YOUR FIGHT! Players not on the fight can cheer and scream and jump histerically, but can not instruct the fighting players on what to do. 2.- NO TIME FOR SCHEDULING! Fighting in the arena is dangerous and chaotic, fighter do not have time to strategically think. We start with a 30 seconds time for each player to make his moves. 3.- TIME RUNNING OUT! When the fight last for so long gladiators become tired and also more and more excitated, increasing the risk to make a mistake. At a number of accorded turns lower the time to 20 seconds. Make it again to 10 seconds if still lasting! Theokeles is 5 attack, 5 defense and 2 speed. Normally the two speed does not hurt him to much because he has 5 defense dice even if the other guy gets first attack. So he is a house and hard to beat, but if he goes against an attacker with 4 speed and that attacker has a trident as a weapon, if the attacker always wins initiative (which is easy to do at 4 dice to 2 dice) Theokeles cannot hit his opponent and will eventually loose. If you see the other house has a trident you may want to choose a different gladiator than Theokeles, or you will loose. Many of the Domini have the ability to stock pile a certain type of character (Guard, Slave or Gladiator) so they can discard them three at a time to gain the influence they need to win the game. Glaber especially because he uses Guards and they can be held in your hand too. Make sure to take precautions if you see this happening so you do not give them the game. This game is about backstabbing and small alliances so make sure you let the others know when you see someone trying to pull this off as well. 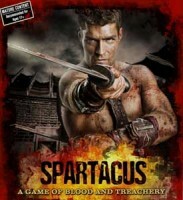 Glaber is guards, Batiatus is Gladiators and Tullius is slaves. Playing for the game winning 12 influence points can sometimes be a chore as players gang up on the leader and generally slow down the end of the game. Instead, start players at 4 influence and play for a time limit or a turn limit. When the time is up, whoever has the highest influence wins and ties and judged in the same way as the standard rules. A turn limit of 8 turns will get a four player game through half of the market deck, of course if someone reaches 12 influence before that time they win the game as per the standard rules. Our gaming group was finding a general disinterest in the arena phase outside of hosting. Our solution, raise the max bet to 4 gold and disperse the lost wagers evenly among the winners. The increased stakes led to more interest, more politicking (e.g favors and promises if someone agrees to field a slave or throw a match) and more treachery.